I’ve seen a million or more pictures of the Grand Canyon. I thought I knew what to expect when we arrived in Arizona. I was wrong. All the images and all the videos in the world couldn’t have prepared me for the orange, pumpkin and persimmon-striped hues of the cavern below, nor the unimaginable scale of it. No matter which viewpoint we chose on our travels around the South Rim, all we could see, as far as our periphery would go, was Canyon. It was incredible. 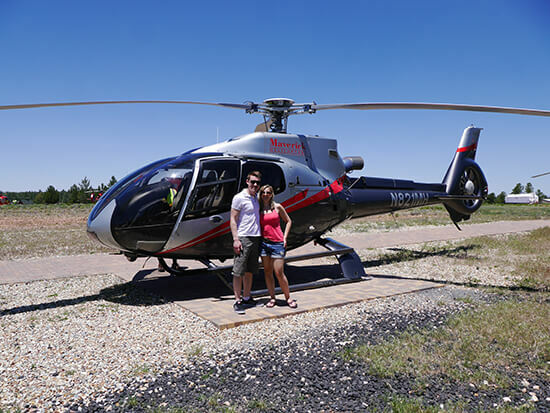 The only thing that made this quintessential USA experience even more incredible was how we saw the Canyon: from above in a helicopter; across the tarmac in a Jeep; and after dark, beneath a canopy of stars. 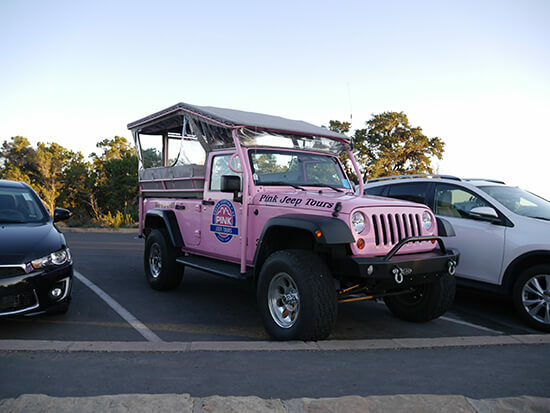 We were onboard a Pink Jeep tour from the gateway town of Tusayan when we caught our first glimpse of the Canyon. It was just before sunset, and we could see the burnt orange outline of the rocks peering out from behind the trees, teasing us as we drove past. A few moments later, the woodland cleared, the landscape opened out and we saw the vast chasm in all its glory. “You’re seeing about a third of the Canyon from this point,” explained our Pink Jeep guide Cory. His comment surprised me – surely it couldn’t be three times the size of what we were seeing? It was already huge! 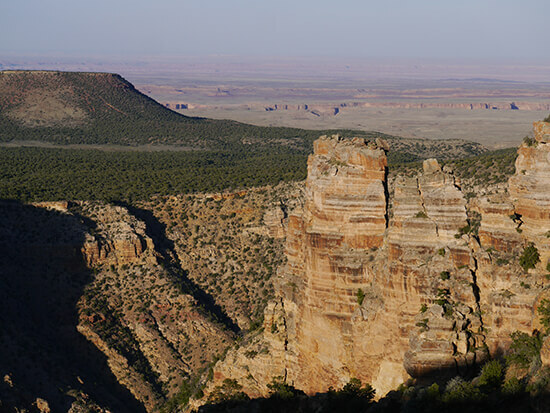 But then, the Canyon is 277 miles long and up to 18 miles wide. We pulled over for a better view. I couldn’t stop looking. 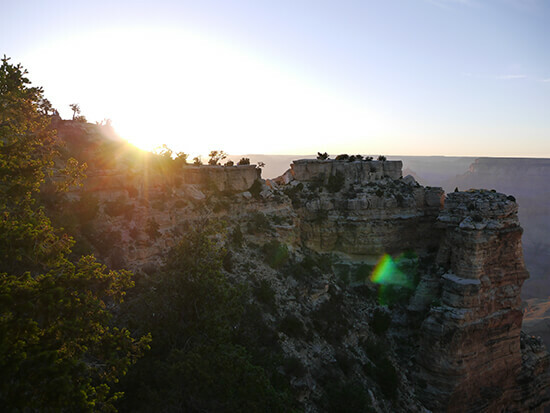 We made several pit stops along the South Rim as sunset drew nearer. And when that orange ball eventually began to drift towards the horizon, the Canyon somehow became even more picturesque. The camera just doesn’t do it justice. In reality, the crags, undulating cliffs and orange rainbow of colours almost don’t look real; the immeasurable beauty was just too much for my tiny brain to process. If I thought seeing the Canyon from the ground was too much to compute, I was to be even more blown away by seeing it from the air. 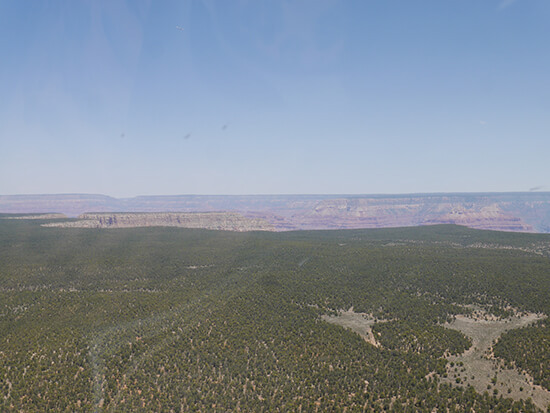 The next day we got the chance to explore the South Rim on foot (and shuttle bus) under our own steam… but first we were to spend 30 minutes soaring above the North Rim with a Maverick Helicopters pilot. If you’re thinking ‘hey, that name rings a bell when paired with helicopters’, then you’d be right: the Maverick Helicopters moniker marries up with eighties flick Top Gun and its leading, daredevil character, Maverick. Unfortunately we weren’t flying with Tom Cruise on this occasion, but our pilot did play Danger Zone for us on his iPod. He also blasted out the Jurassic Park theme music – perfect for setting the dramatic mood. Sat in the co-pilot seat, I felt a smile curl my lips as we hovered above the trees, bound for our destination. I could see the tips of the Canyon’s escarpments on the horizon and, as we drew closer, that’s when the musical overtures kicked in. I held my breath as our pilot seemingly defied the laws of aerodynamics and swung the craft round at an angle so we were hanging above the forest-clad rim. If Richard Attenborough had been there to utter the words ‘Welcome to Jurassic Park’ the trip would’ve been perfect. I took just four photos while we were in the air – I couldn’t bear to distract my eyes from the landscape any longer then absolutely necessary. I wanted the image of this natural wonder to remain on my retinas for as long as possible. We spent two days exploring the Canyon, but it didn’t end when the sun went down. As serendipity would have it, our trip coincided with an annual astronomy event – the 2016 Grand Canyon Star Party – so we spent our final night plunged into darkness. “We’re currently trying to get International Dark Sky status,” our guide told us. I couldn’t see her though, she was enveloped by blackness. Not that it mattered – the star (or rather, stars) of the show was above our heads. The Milky Way, Jupiter and Mars shone bright – brighter than I’d ever seen them before. 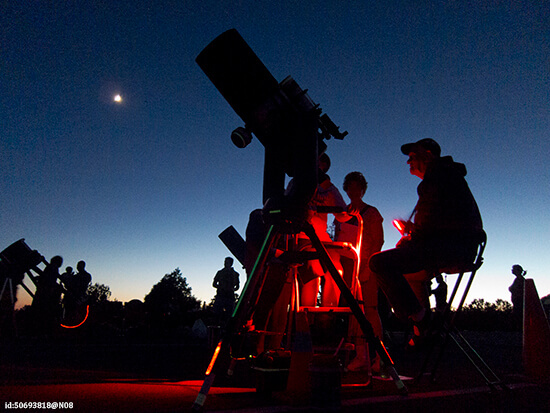 Budding astronomers had come from all over the country, laden with telescopes and lens of every size – set up for visitors to wander around and stop to spot a certain star or planet. My favourite? Seeing Saturn’s rings through a telescope the size of a Smart Car. As we wandered through the assault course of astrology equipment, we kept pausing to gaze skyward. It was lit up like a dozen twinkling Christmas trees. The constellations were near-impossible to pick out amid stars that are rarely glimpsed in the light-polluted skies of the UK; it was difficult to process this was the same sky we had back home. As we stood next to one of the most iconic sights that Mother Nature has gifted us, I could hardly believe our time at the Grand Canyon was almost over... but I knew one day we'd be back. 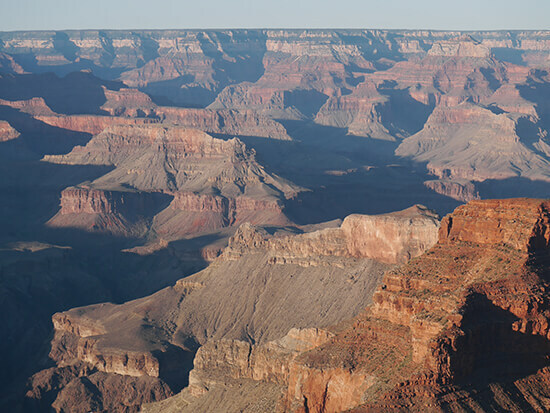 Alex visited the Grand Canyon as part of our California & Canyons Journey. To book a trip like hers, or tailor make your own USA holiday, speak to one of our knowledgeable Travel Experts today.